Keep your workspace tidy in style, with your own personalised pen pot. 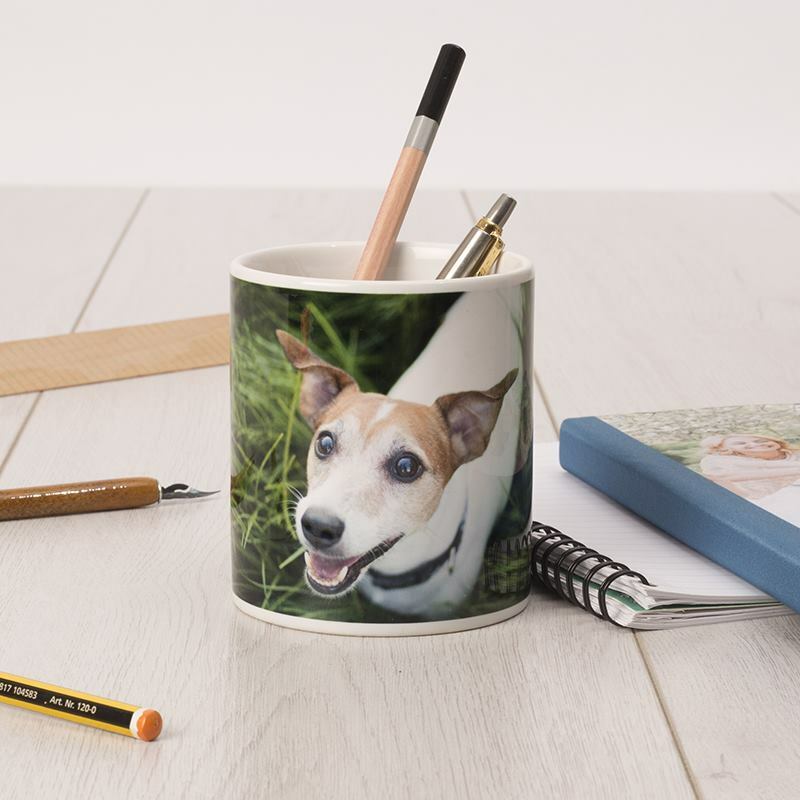 A gorgeous ceramic pen pot featuring your photos or designs is the perfect way to breathe life into your office, studio, or home whilst staying organised. This personalised pen holder makes the ideal housewarming gift for a special someone or a stylish treat for yourself. Your desk or office is at the heart of your work, so it’s important to keep things neat and tidy for your creative flow. You might want to organise your studio, or simply find a stylish way to store your pens in the home. Wherever you write, you can rest assured that no pens will be going walkabouts or getting lost with your own photo pen pot. A personalised pen pot featuring your photos is a stunning way to add some colour and fun to your space. The pot is both sturdy and chic being made of ceramic, and your design wraps all the way around so it looks beautiful from every angle. Who Will Love These Pen Pots? These pen pots are perfect for anyone but particularly useful for artists working in a studio, or anyone who works in an office or at a desk. The personalised pen pot will help keep your workspace tidy, meaning creative ideas can easily flow with nothing getting in the way! Our specialist printing process results in a permanent print, which won’t fade over time and is scratch resistant. Your design will be reproduced in sharp detail with vibrant, full colour and an even tone. The style of the photo pen pot means that your design will wrap all the way around, so you can impress from every angle. A lovely gentle gloss surface finishes off the ceramic pot, bringing your designs to life. Every piece is hand-printed to order in our London factory, using environmentally friendly printing inks and ethical practices. A lovely family photo can bring some life to the area and makes an extra special personalised gift. If you’re designing a personalised pen stand as a housewarming gift for someone, have a think about their current colour schemes and décor preferences. Do they prefer muted tones with subtle patterns or bright and bold designs? Encourage the kids to keep their creative spaces tidy with a funky and colourful printed pen pot – make tidying a little bit more fun with a print of their favourite cartoon characters. The print wraps around the personalised pen holder, leaving a small gap at the back where it meets. However, your design is not affected and we take extra care to ensure it still looks as it should.